Recreational boat sales posted their second consecutive month of weak growth in October, leaving the industry farther from the full-year gains forecasters were hoping for when 2016 began. Industrywide sales rose just 1.3 percent to 6,953 boats and sales in the main powerboat segments declined slightly — 0.3 percent, or 14 boats, to 4,908, in 28 states that represent about 62 percent of the national market, Statistical Surveys reported. Through October, sales in the main segments were up 4.4 percent in the early-reporting states at 147,160 boats and 4.1 percent industrywide at 228,379, a percentage point or two below the growth that was predicted. Statistical Surveys sales director Ryan Kloppe said that despite the generally flat sales there were solid gains during the month among aluminum fishing boats, ski and wake boats and personal watercraft. And, he said, sales at fall shows — particularly the Fort Lauderdale International Boat Show, where “the feedback I heard was good” — should help boost November and December sales numbers. “I think we’re still on pace for 5 to 6 percent overall sales growth for the year,” he said. Fishing boat sales rose 7.4 percent in October to 1,313, sales of ski and wake boats rose 11.4 percent to 245 and PWC sales climbed 13.3 percent to 1,117. Kloppe said fishing-boat sales in Arkansas were up 40 percent to 172 and they were up 60 percent in California to 140. Other high-volume categories did not fare as well. 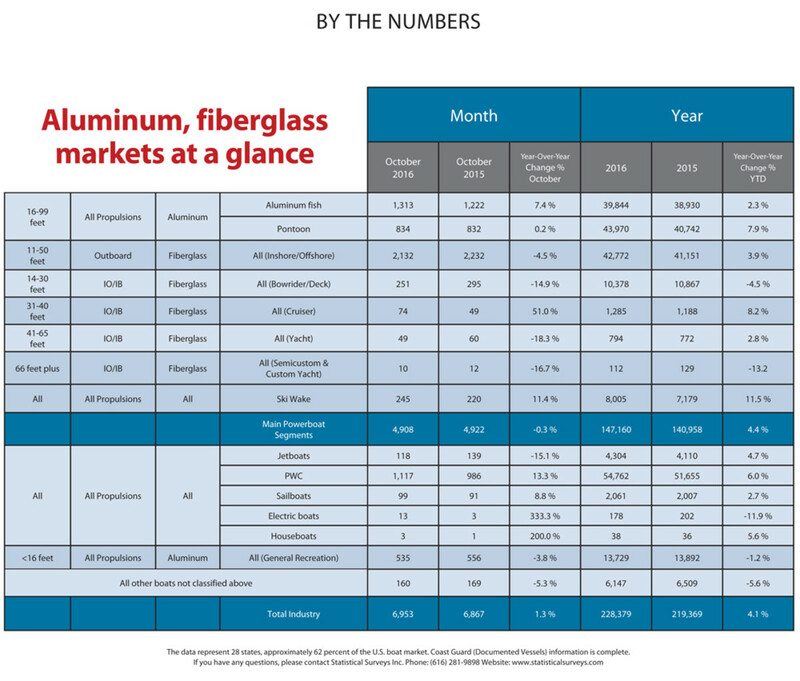 Sales of aluminum pontoon boats were nearly flat, rising 0.2 percent, or two, to 834, and sales of 11-to-50-foot outboard fiberglass boats fell 4.5 percent to 2,132. Sales of 14-to 30-foot inboard and sterndrive boats fell 14.9 percent, to 251, but Kloppe said sales of boats 28 feet and larger in that segment are up 5 percent for the year to date in the early-reporting states, including increases of 20 percent in Texas, 30 percent in New Jersey and 40 percent in Michigan. “The people who want that type of boat are still buying it,” he said. Florida led the nation among the early-reporting states with 1,812 sales, although the total was lower than the previous October, when 1,930 were recorded. Texas was second at 1,014, which trailed its total of 1,134 from the previous year. South Carolina was third at 551, up from 437. Fourth was California at 518 (up from 462), and North Carolina was fifth at 394 (up from 383). The rest of the top 10 were Michigan at 335 (up from 320); Alabama at 312 (up from 261); Arkansas at 247 (up from 201); Tennessee at 230 (up from 186); and Washington at 199 (down from 209). The Coast Guard was up to date in its reports on documented vessels, providing complete figures in the bigger-boat categories. Sales of 31- to 40-foot cruisers rose by 25 to 74. Sales of 41- to 65-foot yachts fell by 11 to 49 and sales of 66-foot and larger semicustom and custom yachts declined by two to 10. Sailboat sales rose by eight to 99.